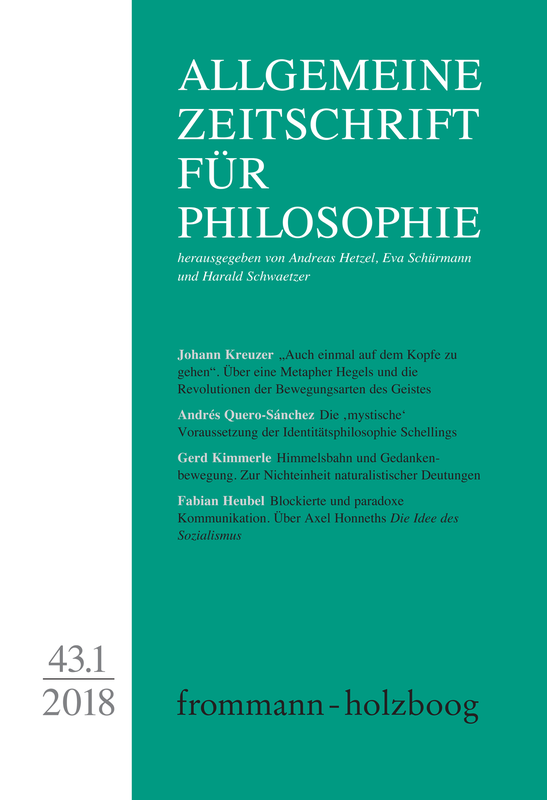 With contributions by Bernadette Collenberg-Plotnikov, Fabian Heubel, Gerd Kimmerle, Johann Kreuzer, Birger P. Priddat, Andrés Quero-Sánchez and Norman Sieroka. The paper discusses the specific dynamics of the metaphor ›Auf-dem-Kopfe-zu- Gehen‹ (to walk on the head). The story of the use of this metaphor reaches from Hegel and Marx beyond Georg Büchner to the discussions of the dialectics of putting on the feet what is meant to be walking on the head. A special turn was given to the metaphor 1960 through Paul Celan in his ›Büchnerpreis‹-address. The remarks on the story of the use of the metaphor discuss in one direction her epistemic and mind-conceptual subtexts: focus here is Hegels reference to Kant. The other direction of the story treats the ›real-dialectics‹, historic experience is giving through forms of reality which realized the social consequences of ›walking on the head or on brains‹ alone. The French Revolution and her ›terreur‹ Hegel analyzed as explicit proof. Hints to resonances of the discussed issues in Jean Paul, T. W. Adorno and Paul Celans ›Meridian‹ conclude the paper. ›Mystical‹ thought had a strong influence on Schelling’s philosophy not only after 1806/1809, but also on the philosophical projects he had developed before that time, i. e. before having moved to Munich in 1806. This is true of his Philosophy of Nature, as scholars have already often noticed, but also – and maybe particularly – of his Philosophy of Identity as well as of his early reception of both Fichte and Plato in Tübingen. However, the author is not raising here the historico-philological question, but is more interested in the systematic aspect of the relationship between Schelling and – particularly – Meister Eckhart’s ›Mysticism‹. Fiction and reality are not contradictory. The Copernican astronomy for example proves that transcendental fictions (and their historical change) are presupposed in scientific observations and descriptions. This also applies to the normative order of the human life and social life, wherein the free will is of fundamental importance. The most recent brain research has often tried to unmask the concept of free will as an illusion. Starting-point is the supposition that everything that cannot be brought into the form of scientific fact does not exist. This is not justified in social reality, even in a naturalistic sense. The »original idea« of socialism is, according to Axel Honneth, marked by the »normative intuition« to create a relationship between liberty, equality and fraternity »in which these principles would mutually enable each other« and in which »all obstructions to the even realization of all three principles of the French revolution« would be removed. My reflections on Honneth’s reconstruction of socialism starts with the assumption that the relationship between the three revolutionary principles is a normative paradox constitutive of modern politics. In the first part, I discuss Honneth’s idea of blocked communication between the three principles. The second part is dedicated to the structural correspondence between the three principles, the three spheres of Hegel’s conception of morality (family, civil society and state) and, furthermore, to the three great modern political ideologies – liberalism, socialism and conservatism. The third part revolves around the concept of »communicative equalization« and explores the question of whether a normative de-hierarchization of the three moments is necessary in order to think the possibility of an »even realization of all three principles«. In the last part, these considerations are continued with the help of the concept of paradoxical communication, which is linked to the interpretation of negative dialectics as an exercise in critical self-cultivation. Birger P. Priddat: Eine Ethik der Urteilsenthaltung im Verzeihen?